WALNUT—A band of 74 Chaparral Middle School musicians stepped onto the biggest stage of their lives to perform before over 3,700 educators on Friday. 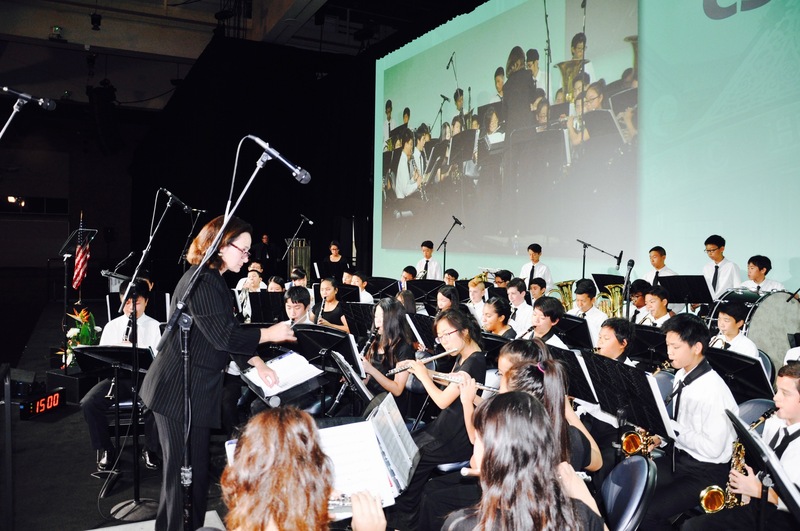 The school’s 8th grade Wind Ensemble, under the direction of Leslie Schroerlucke, was tapped from 1,100 California school districts to play at the California School Boards Association (CSBA) Annual Education Conference held at the San Diego Convention Center. After the two-hour bus trip, the young musicians arrived at 10 a.m. ready to unpack a truck full of instruments. An hour later, the CSBA event committee led students to the 100-foot stage to rehearse two songs, and practice filing on and off the towering platform. After, students enjoyed lunch behind the stage, while many passed the time quietly playing video and card games, and even sharing photos of pets on mobile phones. Flutist Hannah Geere was a featured soloist in the first piece. “I’m excited to play today!” she said prior the special performance. By 1 p.m. it was show time. The teens silently carried their instruments onto the stage, swiftly taking their seats, awaiting the cue to begin playing. Schroerlucke selected an arrangement of “Be Thou My Vision” as a tribute to the audience filled with school board members and superintendents. “Thank you for your unwavering vision to provide the best possible education for students throughout the state,” she said. The second song was a rousing rendition of “Fairest of the Fair,” a popular John Philip Sousa march. The troop received an enthusiastic standing ovation after the exemplary performance. “I’ve been coming to these CSBA conferences for over 25 years, and this was by far the best performance I’ve ever seen,” exclaimed trustee Larry Redinger. Being chosen as the featured student entertainment for the CSBA event was the culmination of three years of hard work, Schroerlucke noted. Most of the Chaparral students first picked up instruments in elementary school in the 5th grade introductory band program. Several band parents made the trek to San Diego for the December 1 performance. Terri Lotto said she remembered when the young musicians were playing “Hot Cross Buns” just a few years ago. “And suddenly, they’re playing Sousa!” she said. “It was a great experience watching my son and his school band perform. They were amazing!” added parent Anita Feng. Veteran educator Schroerlucke advocates the Arts as a means to nurture creativity in students as they move toward the 21st century workplace. She proudly serves as one of the lead Visual and Performing Arts (VAPA) teachers for the Walnut Valley Unified School District. “The key to our success is the value parents place on music education, District support, and excellent teachers,” she said. Over 600 students at Chaparral, about 60 percent of the school population, are involved in choir, orchestra, and band programs. “Music is taken seriously and students are held accountable for their work as in other classes,” she added. CSBA officials told students they were the largest group to ever perform during the conference. The Chaparral Middle School Band Program has been lauded with national and state honors. The Wind Ensemble has performed at prestigious venues, including the Kennedy Center’s John Music Sousa Festival, as the only middle school band in the country for which they commissioned and premiered “Memories of Sousa” by Buster Clements and Chicago Symphony Hall. In 2017, the ensemble performed at the Los Angeles Festival of Gold, receiving a gold rating and first place ranking, while competing against high school ensembles. In March, the group is slated to perform at the Chicago Symphony Hall.